As we reported on 3/12/14, this property was sold to an LLC headed by Jeremy Foraker, one of the former leads for Land Run (The Rise) who has formed his own development and brokerage company. Now, plans have been submitted for a mixed-use project with a restaurant, coffee shop and multi-tenant office space. 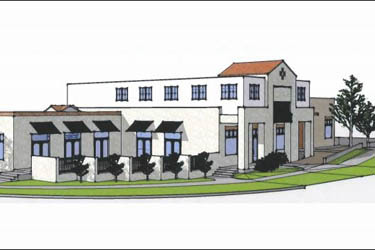 The building would be 9,048 square feet on two levels and is located on a highly-visible property at the southern entrance to the Paseo District. It is currently a vacant lot. Shaun Fiaconne, who owns and operates Picasso’s Cafe in the Paseo, will be developing the restaurant concept. I've wondered about this space for some time. Seems like a great place for mixed use and residential. Crap! I was hoping for a beer garden! Is this the same space rumored to possibly be a bier garten? Pete's description certainly would not preclude that use. That is a big space that can house multiple tenants and uses. Yeah, I had heard a rumor about a beer garden for this site. Don't think that is happening; at least not here. Great site for real estate development. A beer garden can go anywhere almost, and tends to thrive in more intimate settings than such a key parcel on a thoroughfare. Which Walker can be. Article at top of the page has been updated to reflect plans for restaurant, coffee shop and office space in a new 2-story building that has been proposed. Half the site is taken by parking. The patio and bar with overhead doors looks slick and will add some much-needed life to the south end of the Paseo. But, at least the parking is to the south and not fronting the building. It looks like there is a good size patio area and the building is pretty close to the street. I am ok with this layout, not sure how I feel about the design of the building considering what all is around it. 1) Objective criticism: If the elevations are to be believed, this building will be 80-90% EIFS with only small amounts of brick and stone. Subjective criticism: It's ugly and the proportions are all wrong. This stands a high likelihood of looking cheap. 2) The site plan could be much better. There is no need to for a curb cut on Walker for the parking lot. This lot adjoins an alley that would provide the necessary vehicular access. Here is my suggestion to make it better: shift the parking lot west, and shrink it a little. Provide parking lot access through the alley. Continue the building along Walker to the alley. Work with the City to provide 2-3 street parking spots on Walker to offset the loss of parking. I'm working on getting better renderings. Most of the existing buildings on the Paseo strip are EIFS are they not? This might be a case when it is actually appropriate and will fit in with what is already built. Stucco, used on the existing building stock in Paseo, is a cement based product that is layered over wire mesh. It lasts a long time. EIFS is a synthetic coating applied over foam. If done well, it can look very nice, and it provides good insulation (that's what the "I" stands for). Unfortunately, most EIFS buildings around here tend to look kind of cheap after not too long. Someone smarter than me can tell us why the EIFS I've seen in California and New Mexico looks better than it does here. Well I know that using light colors, especially white like Level did, can look dirty very quick when the wind blows red dirt around. The material used on LEVEL was not the type of EIFS that is applied over foam board; it was troweled over a cement board product. I suspect Oklahoma's extreme temperature swings are tough on any applied surface. Even in the case of traditional stucco, it's mainly used in temperate climates. I meant not extremely cold. It is cheap stucco and is already problematic. If you want stucco it should be done right. It may be the best fake stucco, but it is still fake stucco. We still have a ways to go here in OKC until we recognize what is good construction and what is not. LEVEL used one of the best synthetic stuccos.